Speaking figuratively rather than biologically, the link between Netaji, the name by which he was commonly known, and the man after whom he was named, though reminiscent of the Darwinian puzzle, did not constitute a missing category altogether. Far from it indeed, for he was known to have served in the INA and even participated in guards of honour inspected by the GREAT ONE. Neither his appearance nor his activities betrayed any exposure to the martial arts of course. Even the closest amongst his buddies would hesitate to credit him with a height exceeding 5 feet on the outside, while his bow legged gait, as he roamed the office corridors somnolently, swaying penguin like from side to side, bore little resemblance to a gun-toting soldier. To be fair though, he must have been agelessly aged, well past his military prime at least, when our first encounter took place in Yojana Bhavan on Parliament Street, where the Planning Commission is located in Delhi. He had joined the organization as a Class 4 employee in sterile official parlance, during an era when birth certificates were the least essential of documents needed for verifying the duration of one’s existence on earth since arrival. His official name too, like his date of birth, belonged to the realm of conjectures, and accustomed as he was to being addressed by all and sundry as Netaji, he could have lost track himself of the name his loving parents bestowed on him. There was no trace left, either of the British Raj or his hero, at the time he started working for India’s planners, but his illusions surrounding the part he played in our freedom struggle probably continued to hold him under its grip. 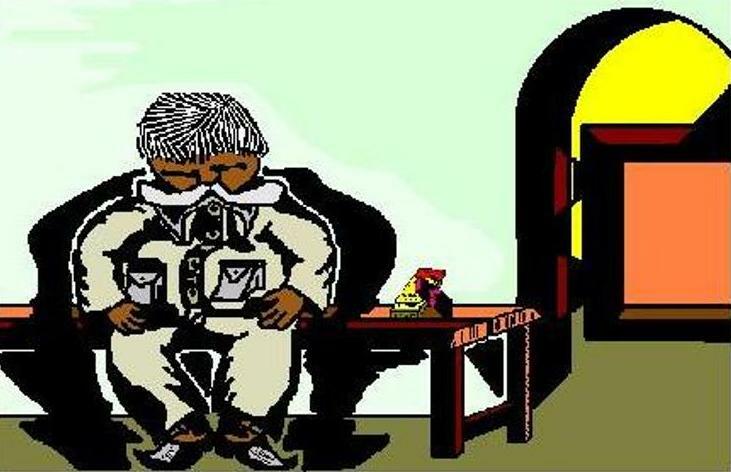 The well- groomed military moustache he sported, grey though it was, bore ample evidence to this fact, though the grimy, once white, safari suit like government uniform he was permanently attired in, failed to live up to its grandeur. I was myself a new recruit at the Indian Statistical Institute when I made Netaji’s acquaintance. The Institute had a wing assigned to it in the Yojana Bhavan, a relic from the period when Professor P.C. Mahalanobis took charge of the Second Five Year Plan at Pandit Nehru’s behest. Our love affair with the Planning Commission had long ceased, however, when I joined the Institute. We enjoyed at this time the status of an insecure tenant at best, but we stuck to the Bhavan, like a vice as it were, since our new campus in South Delhi was not yet ready to be inaugurated by Prime Minister Mrs. Indira Gandhi. Besides, like Netaji, we too might have been basking in the reflected glory of our mentor, prodded by a self-deceiving belief that the Planning Commission considered our services to be indispensable. There was an imperceptible bond, therefore, between Netaji and the Institute. He dreamed of battles waiting ahead in the jungles of Burma, while we kept offering unsolicited advice to the government on ways out of India’s poverty trap. Fortunately for humanity though, neither did he ever wake up to reality, nor did the government heed our policy prescriptions. The nature of duties assigned to Netaji was not exactly clear, for he was one amongst the many underemployed workers in the government sector, starting from those sitting at the top right down to the ones in charge of filth accumulation in every conceivable corner of office buildings. If our governments are viewed as benevolent rulers committed to the cause of uplifting Indians at large, neither Netaji nor his peers could be held guilty of realizing that promise. Yet, as we know in today’s environmentally conscious world, nothing in God’s creation, from crocodiles to white ants, lack a purpose. Each species is needed in optimum numbers to maintain the balance. Netaji too served a function, not related to conservation unfortunately, but to destruction. He posed, in other words, a threat to the environmentalist dream, but his actions did not violate the principal tenets of Hindu philosophy either, consisting, as we know, of the holy trinity of creation, preservation and annihilation. To move from the abstract to the concrete, Netaji fulfilled his destiny by helping irresponsible occupants of Yojana Bhavan to contribute to atmospheric pollution. I know about this particularly well, since I was a direct beneficiary of the not-so- clandestine unofficial business he transacted, sitting on a bench in a corner of the wing my Institute occupied. He sold cigarettes and I, amongst many others, was a regular customer. We were located on the top floor of the building and, like everyone else in the neighbourhood, were lazy bums, who found it too much of an inconvenience to board the elevator, or walk down, to the ground floor to purchase supplies from wayside shops. Netaji, though not as immobile as a sailing ship trapped in the Sargasso Sea, was not particularly inclined towards display of physical prowess either, as far as his official functions were concerned. But his agility was boundless in matters that lay beyond the call of official duty, to prove which he carried ample stocks of all the popular brands in his bulging pockets. And we in turn helped him run them down before lunch hour. This was no problem of course, since he would be back soon enough with fresh supplies for the post lunch session. There was an unwritten law though that his shop would close its shutters for a certain duration following lunch. This was necessitated by his basic need for a siesta, which he enjoyed on the very same bench that served as his sales counter. None of us normally disturbed him at this hour, in deference to the lavish help we received from him to damage our own respiratory organs as well as those of non-smokers in our vicinity. Yet, I must admit, that I occasionally found it impossible not to raise him from his noonday dreams for a fag or two when my nicotine urge got the better of me. I can’t say that he was elated during these transactions, but he did not refuse to oblige a regular customer, steadfastly devoted as he was to his role of a demolisher. I can’t recall exactly the number of years that our relationship lasted, but a rough calculation indicates that we carried on for four to five years at least. And on the first day of each of these passing years, he would invariably tap on the doors to our offices, peep in and greet us all, in a phlegmatic drawl, with the words — Naya saal Mubarak! It makes little sense to be emotional over such inconsequential incidents. Yet, I think I feel a lump in my throat when I relate this fact. There was an element of genuineness in the New Year’s greeting he showered on all he knew, independent of official status, especially so since he had nothing to gain or lose from this act, socially speaking. It was as pure a greeting as the innocent smile on the face of a baby in arms. My contacts with Netaji came to an abrupt halt though, more to his discomfort as it happened, than mine. Our unsigned mutual separation occurred when, for the umpteenth time in my life, I resolved to quit smoking. So, one fine morning, without any prior notice at all, I walked past his shop not caring to even glance at him. I looked away from him, needless to say, to keep temptations at bay. But he probably interpreted my behaviour his own way, that I had shifted my allegiance and started patronizing his competitors in the building. And as I continued to ignore him on a regular basis, his vague suspicion turned slowly into firm conviction. This was all too evident from the expression I detected on his face from the corner of my eye every time I walked past him. It was no bewilderment that I discovered there, but a feeling bordering on hatred against the traitor. I bore the cross however with bated breath, especially so since I knew that we would soon be moving out of Yojana Bhavan to the aforementioned new campus. And indeed, the movers too arrived according to plan. They packed the furniture in our offices as well as our books and journals and the caravan was flagged off towards its new settlement at the far end of the town. On my way out of Yojana Bhavan, on the last day I attended office there, I felt I owed a good-bye gesture to Netaji, the soldier who had held fort with uncompromising devotion during my addiction-filled days. Unfortunately though, I had to leave early, soon after lunch hour, the time reserved for his siesta. Nonetheless, I recalled those occasions when he would break the rule to satisfy my thirst. So, I went over to his corner where he lay sleeping, facing the wall. I cleared my throat to attract his attention. But the noise I made, perhaps wilfully, out of cowardice, was not loud enough to wake him up. I kept staring in hesitation for a while at the little man, pockets bulging as always and finally walked away without turning back. New Year’s Day was still a month or two away. I never found out therefore if he would peep into my office to say Naya saal Mubarak anymore. I just read and enjoyed your sketch of Netaji. I admire the grace and clarity of what you write and cannot imagine I’d be able to write either fiction or a memoir that anyone might enjoy reading. Thank you for taking the trouble to read this. I enjoy writing, though it took me almost all my life to realize this fact. Incidentally, Netaji is the name by which Indians usually refer to one of our best known freedom fighters. If you feel inclined to know about him, you will find a reasonable account here . The person I wrote about had joined the INA (Indian National Army) which Netaji had formed to throw away the British rulers. People referred to him as Netaji as a joke. Enjoyed reading it: as usual a very interesting read. But at the end there are a selction of related posts: what took the cake was “Sudden Encounter” by Rabindranath Tagore. Thanks for reading. I will let Argha know about your comment on Sudden Encounter. Reads good. Didn’t you write about this cigarette man earlier, if I recall right? BTW, how does one forward this? You are right. It’s an older piece that I have transferred to the new website I am building. I revised it a bit and had the drawing added. To forward it, just copy paste the link from the window at the top of the page. The person who receives it will merely need to click on the link to be taken to the page. I am truly happy that you read it. Friends matter a lot.